It’s been a very busy time for us here at VINE RIPE DESIGN™ from t-shirt logo designs to web sites! I’ll post separately about the launch of our new VINE RIPE CONSULTING, LLC but it’s exciting times and we’re so lucky to be growing our expertise and capabilities with the addition of VINE RIPE SOFTWARE™. Thrilled to announce that this week I will start to share Vine Ripe Design client interviews. It’s about time that I had some customer feedback on the website, but I wanted to do something that really showcased my customers. The client interview that I’ll post this week is from a great friend and one of my longest supporters! THE STORY: There’s nothing planted in the flower garden right now, we took everything out at the end of the year, it was just overgrown, and the day lilies had seen better days. We had a taste of Spring this week, so I took a peak and saw the daffodils had survived our purge and it just made me smile. 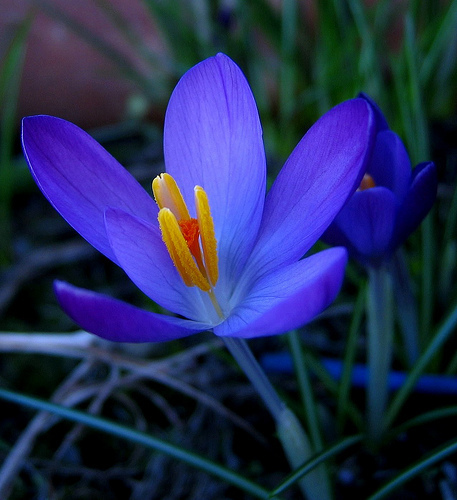 It reminded me how much I love the flowers of early Spring, they are most definitely my favorites. I find the structure and colors of the plants particularly beautiful. I’m not good at gardening and I don’t really like flowers all that much, but I do love landscape and nature, it offers endless inspiration. Hopefully I’ll find some time to plant some more bulbs this year because they’re just so cool and are a cheerful reminder on a cold Winter day that Spring is near. THE STORY: I am really struggling to come up with a design inspiration this week, maybe it’s because it’s the middle of Winter, maybe it’s how sick we’ve been the last couple months, maybe it’s the amount of boogies and snot produced by my 2 year old’s nose this week. I find myself gazing out onto the gray dreary days and thinking Spring cannot come soon enough! This reminded me that St Patrick’s Day is around the corner, a day that everyone can claim they’re connected to the Irish in one way or another, sounds good to me! Especially great is that there’s more green than pink around the stores these days now that Valentine’s Day is over. Also, I find it amusing when a color is named for the year, for 2013 the color is Emerald, which I think is kind of cool, but I have no idea what that means. I suppose it gives the creatives some inspiration, but this week’s post isn’t about emerald, so it hasn’t worked for me just yet, but the year is still young and when it does, then I will be singing it from the emerald green treetops! A healthy Winter weekend to all! Vitruvius’s fundamental principles of architecture: Order, Arrangement, Eurythmy, Symmetry, Propriety and Economy. It can apply to more than just architecture! 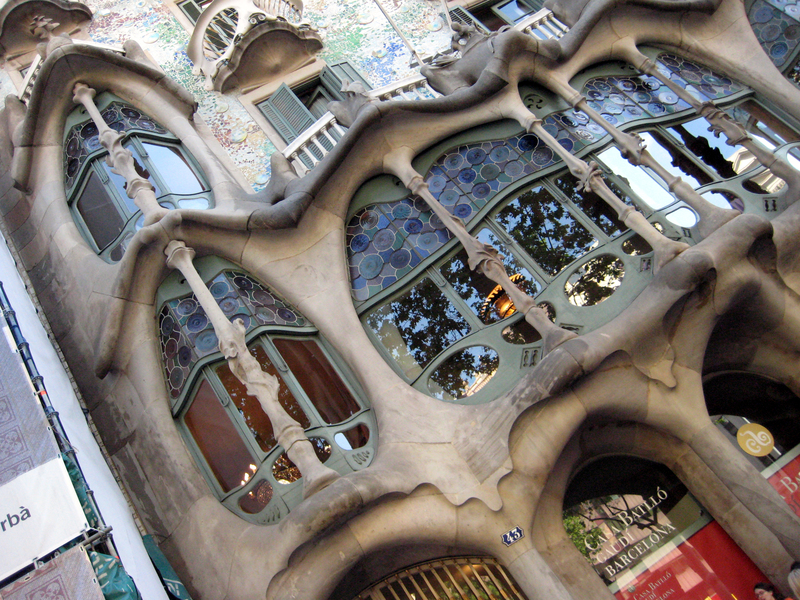 Gaudi swept me off my feet during another project in the same class (great teacher), when I randomly drew the building name out of a bowl that read “Casa Batlló”. I had no idea who Gaudi was except that we’d been told he inspired the word “gaudy” and I thought that couldn’t be any good. Seeing the building in context on an uncharacteristically cold and rainy April afternoon in Barcelona changed my impression completely, it’s on a very bustling street, and while Gaudy’s work is clearly the most creative, it sits scrunched together with other beautiful and distinct homes. Being able to travel around the world and experience where these structures live and the cultures and people that live with them has been amazing. I’ve even been to some of the most holy structures in the world, on a trip to Jerusalem I visited the Church of the Holy Sepulchre and saw where Jesus is reportedly buried, and although I was initially quite skeptical, I left thinking it is entirely possible that He is resting in that tomb! So there’s lots of really cool stuff going on! It’s a busy time at Vine Ripe these days and it’s been so much fun! and i just love that i’m able to work globally and create things for people all over the world! Currently working on a website and 2 logos, I just adore the variety of the design projects, and if you have an idea that you need help with, please don’t hesitate to GET STARTED! custom design work, available now! i recently launched the custom design product at our etsy shop, just click Add to Cart to begin your project today! I’m admittedly a bit of a non-conformist at heart, which I think helps fuel my creativity because I don’t love our overly merchandised world, and prefer things that are hand made, even if it is just a piece of paper with the words “i love you” written on it or “thanks”. Even the simplest thing can be the most thoughtful and personal, and way better than a mass produced greeting card. 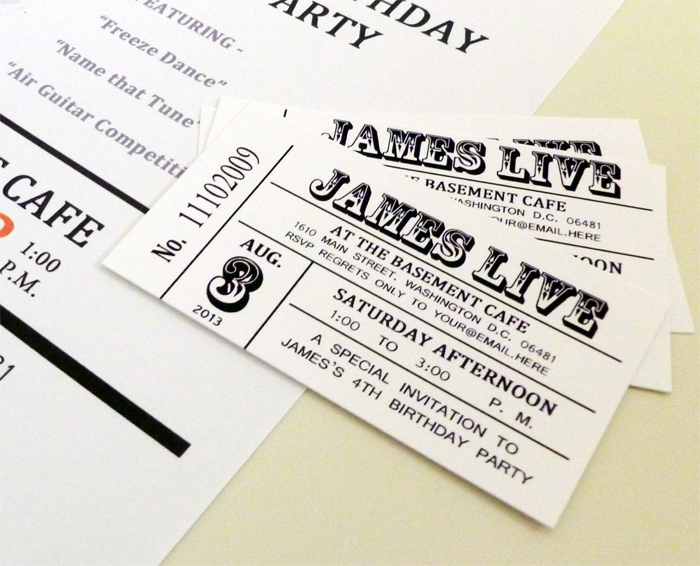 I wanted to throw a Rock N Roll theme birthday for my son, so I sent guests vintage style concert flyers and concert tickets as invitations. I was also able to print extra and use them as decorations at the party! For (completely new) custom work I price each job individually, so don’t be shy, for example: the cost of a non-folded 5×7 in. custom designed party invitation starts at only $15. Click here to learn about our easy & fun process! Contact me to GET STARTED on something a little out-of-the-box!